An inspiration for families, teachers and professionals everywhere! Offering encouragement and insight to anyone whose child faces extraordinary challenges. Chynna Laird of Edmonton, Alberta wrote an original short story that has been published in the newly released Chicken Soup for the Soul: Children with Special Needs, one of the most anticipated book in the #1 NY Times best selling Chicken Soup for the Soul® series. This book contains truly remarkable, inspiring stories of support, understanding and triumph that tug at the heartstrings of anyone who reads them. 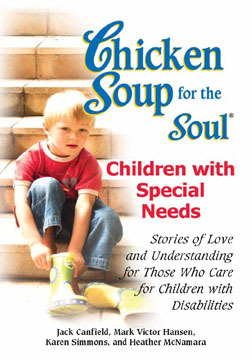 It was selected from thousands of other potential stories to be included in Chicken Soup for the Soul: Children with Special Needs because of its ability to touch hearts. Chicken Soup for the Soul: Children with Special Needs is perfect for every parent, teacher, caregiver or professional who is participating in watching these children grow. This book should be shared with any person to remind them of the profound role they will forever play in their child's life. CHYNNA TAMARA LAIRD – lives in Edmonton, Alberta with partner, Steve, and three children [Jaimie (4), Jordhan (2) and new baby boy, Xander]. She’s a freelance writer and completing a B.A. in Psychology. She eventually wants to specialize in Developmental Neuropsychology to help children and families with special needs. Please email her at lilywolf@telus.net. Congrats Chynna! We at WOW! are proud of you and your accomplishments. I can't wait to read it Chynna! (would it be totally unprofessional of me to *SCREAM*). I consider the two greatest writing achievements for me to be joining the WOW team and writing for Chicken Soup. I am truly blessed. This is a wonderful book to add to your writing libraries. I'd promote it even if Jaimie and I weren't in it because the cause is one close to my heart: kids (especially special needs ones). Gosh, Chynna, you're an AMAZING inspiration. Your kids are so lucky! Big hugs to you (and your kids too). Have a wonderful celebration, and do the happy dance again from me! What a wonderful book! I've got a few of these Chicken Soup books and always love the stories in them. They can be read time and again. This one sounds great!